So, you need to add a dart to a dartless bodice? Awesome, that means maybe you drafted your bodice block the easy way… Basically, you take your body measurements, plot your points, and connect the dots. Easy! Well, guess what!? Adding darts is pretty easy too! Let’s see how it’s done! How to add a dart, two ways…. If you’ve drafted a bodice the easy way, it is equally as easy to add a dart! Don’t get to worried about everything being perfect! That will be your achilles heel…You are always going to sew a muslin for fitting, so you’ll be able to make an necessary adjustments at that time! Step 1 – Measure down from the HPS (high point of shoulder) and mark the bust point. Make sure to stay parallel to the grain line, or CF (center front). Step 2 – Continue line through to the bottom of the pattern (waist), again staying parallel to the grainline or CF. Step 3 – Decide how wide you want your dart to be. Divide that number in half. Add half the measurement to one side of the line at the bottom of the pattern (waist) and mark. Then, add the other half to the other side of the line and mark. Step 5 – Take the full width of the dart and pivot open the side seam. Blend and true all your seams. You can do this one of two ways. First, simply measure and redraw the line using your clear plastic ruler. Or, cut along the side seam from the waist to the under arm and pivot the seam open. 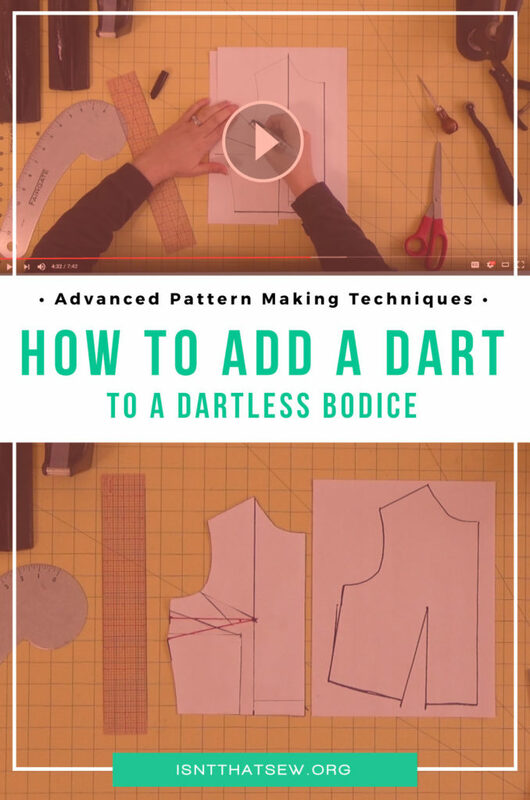 Once you’ve completed adding the dart to the dartless bodice, you can always pivot this dart anywhere on the bodice by using dart manipulation! Cool, huh!? The method used in this video can be used for a full bust adjustment. Keep in mind, the bodice patterns used in both techniques discussed in this article… usea bodice sloper. That means, it has no seam allowance and no wearing ease. They are not finished garment patterns. Also, when performing the method discussed in the video, you will add fullness to the bust. This technique should only be used if you need more fullness in the bust. Hi, I found this to be of great help thanks! I’ll be using the first technique, and you’ve mentioned that you’ve used a sloper. So say after I add a dart and manipulate it as per the design, how do I add ease to it? Seam allowance I generally mark on the fabric directly and not include it in the final pattern. Also about the dart width, are there any standard guidelines I could refer to say as per the bust size? Thank you. Your tutorials are very easy. Apart from this I would like to know how you can decide the width of your darts. I’m a size 12. So it’s rather difficult to find tutorials that caters to my size issues. Thanks so much. For the width of the dart…the larger your bust, the bigger the dart width…I’d experiment with it to get the perfect cup size. Thank you so much, its very clear. You’re so welcome! Glad you found the article clear! I found the video very interesting, and not only for the information but also for the way you explained it, simply, clearly, to the point, not so ‘chatty’ like many instruction videos we get on the internet. Thank you!